Remember the enthusiasm of Mickey Rooney when he got the gang together to put on a play in his dad’s barn. Enthusiasm like that doesn’t die. It might go underground for a few years while economic issues dominate but it will emerge in later life and become the driving force behind Local Theatre. Christopher Guest produced, wrote and acted in a wonderful movie Waiting for Guffman that deconstructs local theatre. Well Judy and Mickey retired to San Miguel and the Barn appears to be St. Paul’s church although there are several other venues in towns where Amateur Night can take place. 18th Play Reading. 7:30 PM. “The Zoo Story”. St. Paul’s Parish Hall, Calle Cardo 6. There’s an amateur theater group called “Players Workshop” performing two seasons per year. The plays they put on stage have a high quality, and delight the public. I saw this lady in the streets of San Miguel and just had to have a picture of someone with that much style. So out went Gwen out with a sketch pad and this is what she came back with. 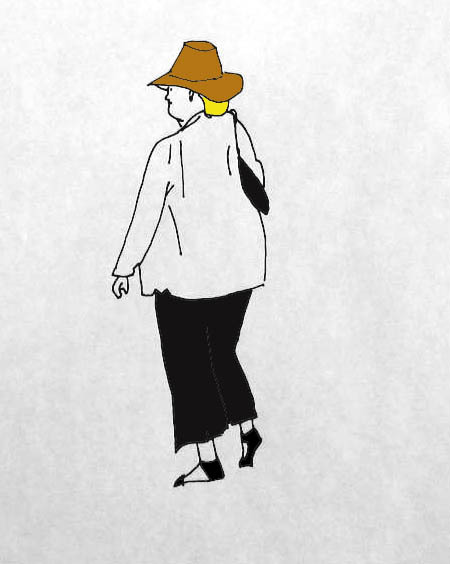 Lady bugs, combat cocktail sandals, a big white blouse, a straw hat and capri pants. I do believe that this ranks with the Mona Lisa in terms of art. Just not sure where to sign my name. Retirement in San Miguel is about Lost Dreams Found. Given the vast stretch of time that exists after work ends, a continuing existence of the Work Ethnic and Living in an Artists Colony, many retirees are looking for ways to fill the hours and begin to look at old Dreams. The I Want to be a Ballerina or a Baseball Player Dreams are gone for ever because the body aged. But the I Want to be a Writer Dream comes back to life with a Vengeance. 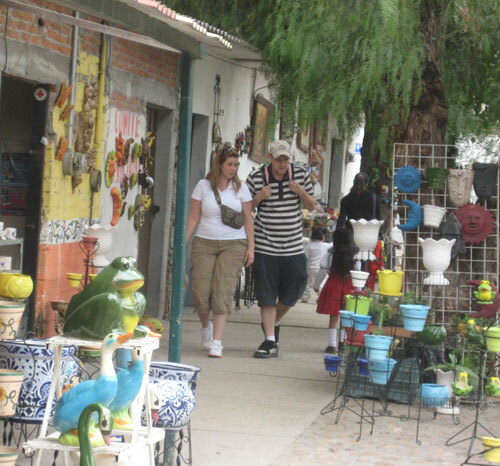 Students can still register for an exciting study abroad program that will include art and creative writing courses in San Miguel de Allende, Mexico, July 18-25, 2009 that is being sponsored by The University of Texas-Pan American. Imagine reading about these Experiences. Okay class look at the following pictures and write from your heart. What an empty heart could do with this. San Miguel has many experiences to be written about and once you start writing, many friends know to stay clear of the Writer in Residence. Where do the Fashions of San Miguel come from? How do they get to San Miguel? They don’t appear to be anywhere else in the world but in San Miguel. They are hard to find even in local stores, that seem to focus on the total pastel color look and the layers of capes and rugs for the shoulders. If you look carefully you can see the Elves of San Miguel sewing right in front of you. Imogene has taken Fred’s old shirts and decide to turn them into a skirt. Every day she sits in the Jardin sewing and sewing the shirt pieces together. 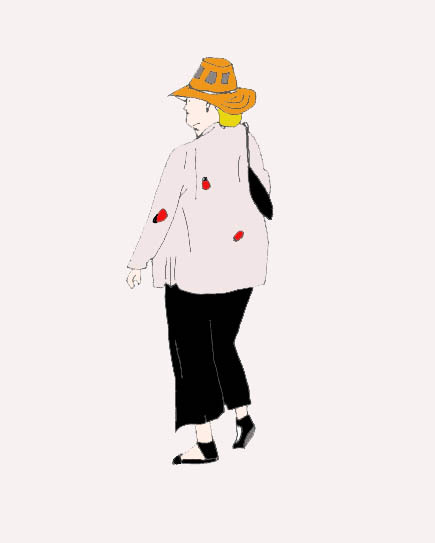 She is on Social Security so she can’t go into the high end fashion stores but she want to be Unique and Different and Artistic. Like the Cobblers of Fairy Tales she is driven by that Magic in San Miguel to finish her creation and be able to walk talk and proud in San Miguel. She is one of the Designer Elves of San Miguel – those magical creatures who can make their own clothes from those designs in her head and from the bits and pieces of her life. There are Communists in Ajijic. Spend a few minutes in Ajijic and you notice all the murals. A quick Google search resulted in an explanation of Mexican Muralism. Mexican muralism is an artistic movement that spans the first half of the twentieth century. It is characterized by the decoration of the walls of public buildings with figurative and realist paintings that have a social and ideological content and marked didactic intentions. According to the principle that art would act as an educational medium to teach the “people” and thus strengthen national identity whilst complying with the ideals of the revolution, the movement began during the post-revolutionary period and successfully constructed the nationalist image with which Mexico embraced modernity. Thus, with art sponsored by the state, at the time considered revolutionary, the movement exalted the nation’s indigenous origins and illustrated the epic events of national history while proclaiming the continuation of the ideals of the Mexican Revolution under Marxist ideology, an ideology which nevertheless formed no part of the revolution, or the resulting state. In the mural below, a muralist educates us about one of the Revolutionary Struggles between the dead proletariat, the well dressed Bourgeois and a priest representing the cooperation of the Catholic Church with the Bourgeois. These communist murals were totally unexpected, after listening to all the Liberals in San Miguel talk about the conservatism of Ajijic. Here was a very public display of the Struggle of the Proletariat of Ajijic. And the Struggle of the Indigenous are not ignored either. There a few murals in San Miguel because Mexican Muralism never came to San Miguel. And if it did they have long been painted over with the color palette of San Miguel (available in Lowe’s in the World Heritage Color Section). I put a request on Civil List for someone to housesit and take care of my dogs when I had to go up to the states. A very nice young lady answered, showed up and seemed to be the perfect person. If you get the name (left out for legal reasons) on your computer shut it down and lock your door. Once she was in my house, all of a sudden emails were ignored and not answered along with phone calls. It was only when I was told there was blood on the upstairs and when I threatened to phone the police to come by that an email was answered. Her story: She cut herself deeply and would have to get some stitches. True Story: According to her friend she smashed a nice $125 lamp of mine into her boyfriend whom she has supported for a long time and he ended up having 22 stitches. When a friend who has walked my dogs on occasion tried to pet one of them once she was gone the dog tried to bite him…so I do not know what kind but there was a definite abuse she and Jeff the boyfriend did to my dog. I ran into a lady on the street and was telling her about the problem and before I could mention her name she told me the name. Seems when she stayed at her house she rented all the rooms out to druggies for crack and pot usage. Not to mention she lost one of her dogs for 3 days. These are the Struggles of San Miguel and there are no murals to display this Struggle. But back to Ajijic and their Struggles. Expats and Merchants in Ajijic take their Struggle to the Street. Stores celebrate the Struggle of Shopping with Murals. Look at the range of Murals one just one street corner and how each muralist has a different view of the Shopping Struggle. Tourist hearts are warmed in Ajijic as their Struggle as a Tourist to find the best souvenir is validated by the murals on every corner. 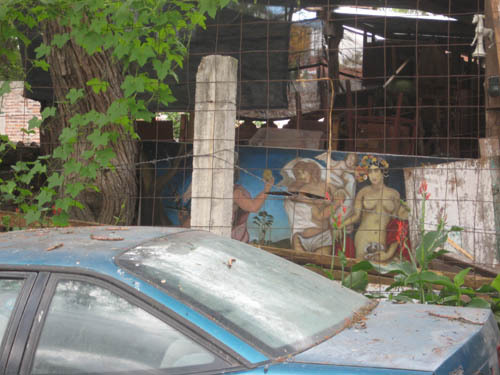 The incidents of Art per citizen in San Miguel is extraordinary. How can all this Art happen in San Miguel, in just one week? Adam Smith used the concept of the Invisible Hand to explain how goods and services became available in a market economy, without any central directing force but economics can’t be applied to art. That would be crass. Art can never be reduced to the commercial. 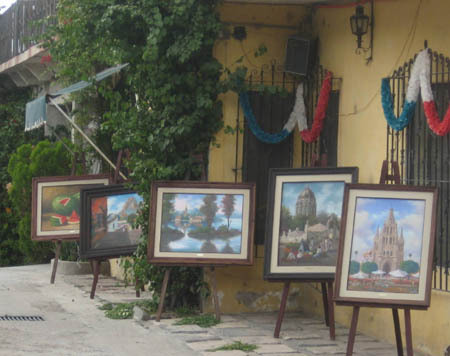 There has to be an intelligence behind all the entertainment and art in San Miguel. Someone has to be co-ordinating the range from street performers to opera singers and actors. There has to be a force, not unlike the Wizard of Oz, that is responsible for keeping the entertainment coming to San Miguel each and every day of the year. The Ringmaster of San Miguel is so busy, every day, that all we ever see of them is their Shadow moving quickly to actualize art in San Miguel. The unknown, unnamed Ringmaster is responsible for introducing all the acts that appear in San Miguel and will, on occasion guide, the audience through entertainment experience. In particular, they start the San Miguel Clap. This is a polite, one hand in the palm clap that accompanies every single public action in San Miguel. It is totally unrelated to the quality of the act nor the appropriateness of the act. Everyone gets a clap in San Miguel – even language instructors. The Ringmaster is the hardest working person in San Miguel. Some much art so little time. The goal of the Ringmaster is to the denizens of San Miguel so busy with the Arts that they don’t realize where they are. 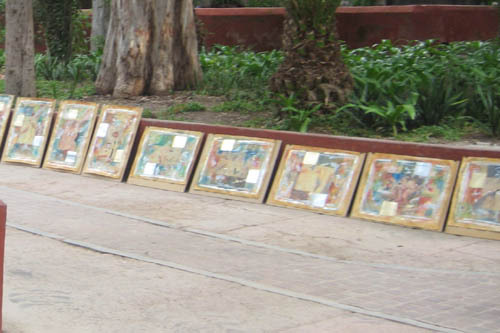 This list was found in the Jardin and only gives a hint of the Art Fun planned for San Miguel. Harry’s is a good place to see some of this. Frida Kahlo is the Elvis or Lenin of Mexico. Her picture is everywhere, particularly on bags. But I have a true story I heard the other day from a San Miguel shopkeeper, who can’t abide stupid people. 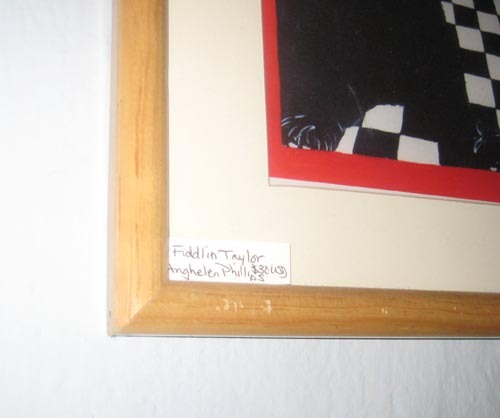 I am looking for an artist called Frida. I want to buy one of her paintings. The store was quite empty the day when I went in. There is no difference between making tortillas and ART. Without sales they both pile up. Granted art has no shelf life, but after a while ART begins to take over space in the STUDIO and the artists will be forced to recognize their connection with the Tortilla Seller. Creativity and Economics are linked. The Artist can’t spend all day in the STUDIO making ART or they will run out of space. 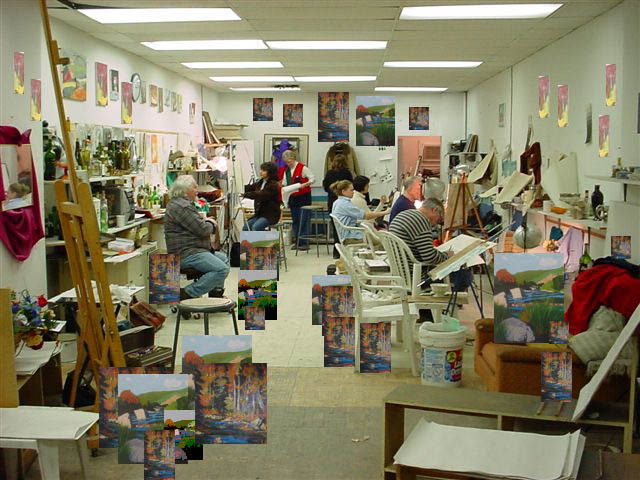 Several local artists have been trapped in their studios for days looking for the way out. 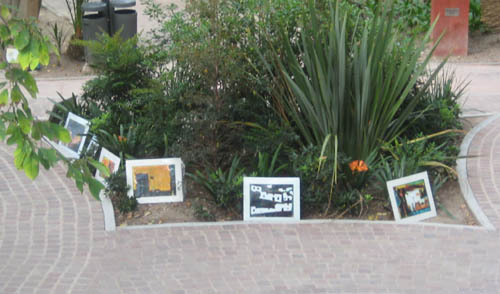 Most start in Parque Juarez leaving a few pieces of art in the Garden to tempt passers by. It sort of like an Easter Egg Hunt but with art. Somewhere in the bushes will be a piece of art for you. Others use the Art Against the Wall strategy to unload the ever growing art inventory. Other use local restaurants to display and store their inventory – name, title and price. It is a win win situation for the restaurant and artists. Restaurants fill their walls for free and artists get to empty out the STUDIO. 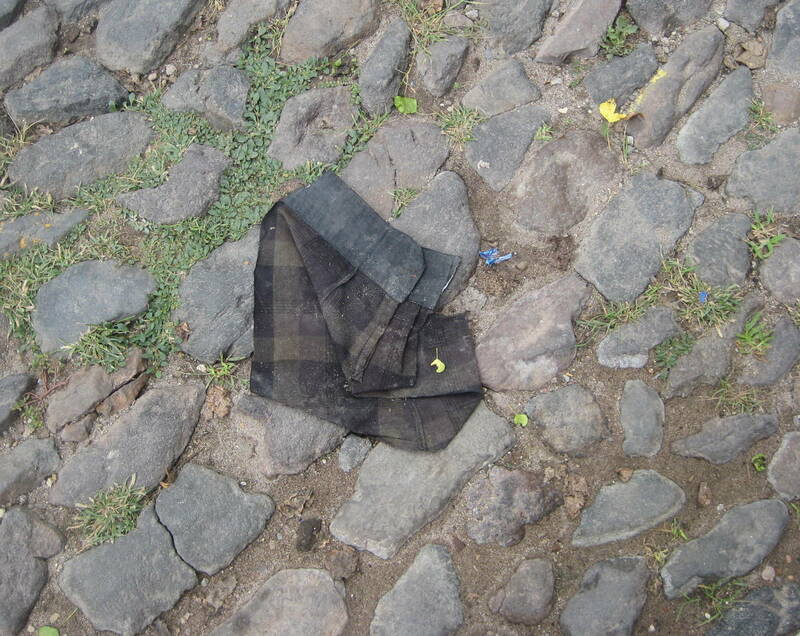 So be careful in San Miguel that you don’t trip on Art. Trip on art and you bought it. The Space Starved Artist has just had something taken off their hands and out of their STUDIO so they can live to create another day. 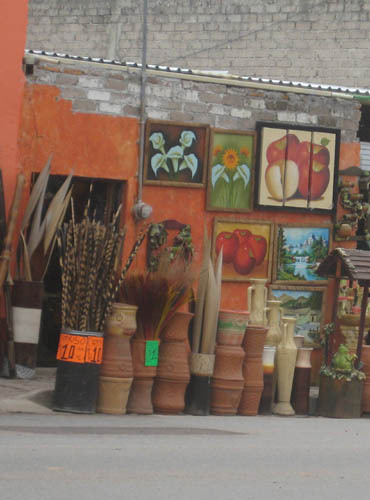 No matter where you go in San Miguel Art is in the Air. It is impossible to walk more than two minutes anywhere in San Miguel before being stopped in one’s track by ART. These beautiful landscape and still life paintings were outside a Gallery. It is like Public ART – no cost just a feast for the eyes and of course the heart. For a small price you can be painted into the picture waving to friends and family at home. This was a special find. It was not a Gallery or Public Art but a wonderful painting sitting in someone’s yard. 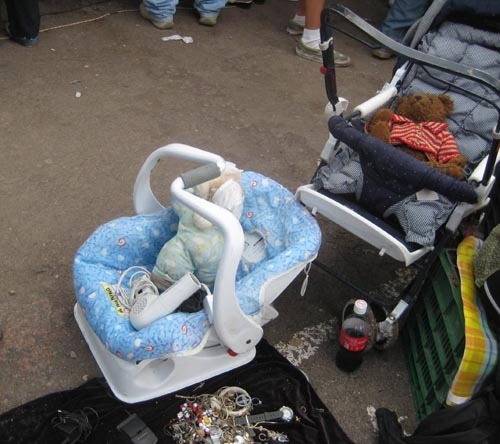 It is called Junk Yard Art. In among the rusting cars, plumbing parts, tin cans will be placed a piece of art just to remind us that we are in an Artist’s Colony and Art is Everywhere. But piéce de resistance is Dolores Hidalgo. located 30 kilometres from San Miguel. It is like Big Box Store of Art waiting to be purchased, displayed and loved. I came back to San Miguel because my Wedding Gift to my niece and her husband was a honeymoon in San Miguel. Here they are in Dolores, in a state of Art Awe. Art Awe happens when there is so much art to take in that your senses shut down and you wander about trying to regain equilibrium. There are so many choices and without a member of the Who’d Buy that Gang to suggest items, the first part of a trip to Dolores Hidalgo is a wanderabout. Where to start, where to start. Well the best place to start is always with a Welcome. 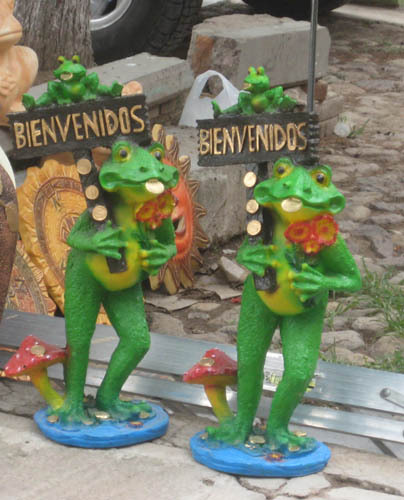 Those Country Kitchen Welcome signs you might hang on a door at home can be replaced with one or two of these Bienvenidos Ranas. Who does want to enter a home with these cute little frogs welcoming them. But better cement them down as a valuable scuplture such as this would no doubt be stolen by Art Poor to enrich their lives. After getting those Cute Welcome Frogs (remember if you can use the word Cute to describe Art it is for you) you move on to Decorating Art. This Gallery stocks Beginning Art. The first two Art purchases have to be a Painting and a Pot. A good rule of thumb is a triptych – the three panel Apple painting is a good buy as you get three for one and can mix and match them to suit your mood. As for the Pot get a big one and fill them with sticks or feathers or Paper Flowers. Get more than one as you can never have too many Pots in your house. The next place to decorate is the Garden and here you can let your imagination run wild. May I suggest a water treatment. Feng shui (literally, “wind and water”) is the ancient Chinese science of filling your garden with Junk. Why not carry the Cute Welcome Frogs into a Cute Frog Waterfall? A theme in Decorating is always show that you pay attention to small details. 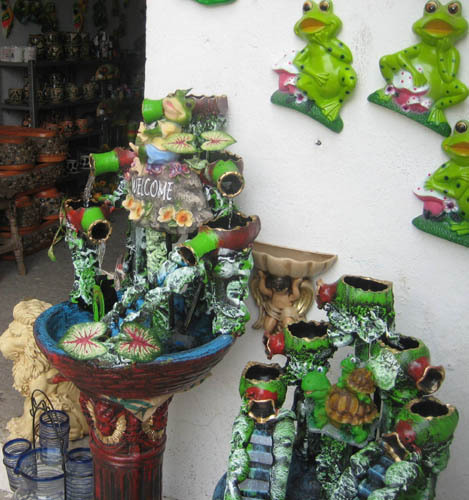 You can never have too many Frogs nor throw cushions nor figurines. How about putting family pictures in Frog Frames? Stendhal syndrome, Stendhal’s syndrome or Florence syndrome, is a psychosomatic illness that causes rapid heartbeat, dizziness, confusion and even hallucinations when an individual is exposed to art, usually when the art is particularly ‘beautiful’ or a large amount of art is in a single place. The term can also be used to describe a similar reaction to a surfeit of choice in other circumstances, e.g. when confronted with immense beauty in the natural world. It is named after the famous 19th century French author Stendhal (pseudonym of Henri-Marie Beyle), who described his experience with the phenomenon during his 1817 visit to Florence, Italy in his book Naples and Florence: A Journey from Milan to Reggio. Although there are many descriptions of people becoming dizzy and fainting while taking in Florentine art, especially at the Uffizi, dating from the early 19th century on, the syndrome was only named in 1979, when it was described by Italian psychiatrist Graziella Magherini, who observed and described more than 100 similar cases among tourists and visitors in Florence. The syndrome was first diagnosed in 1982. The term is often used when describing the reactions of audiences to music of the Romantic period. 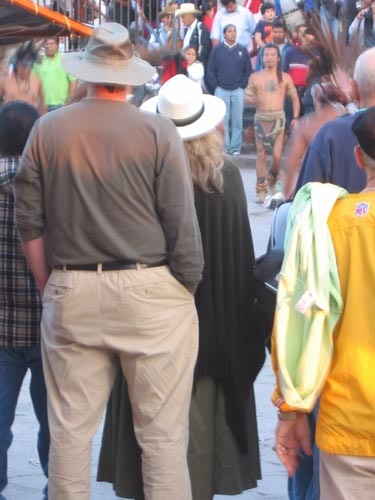 She has come to the Jardin to face the Conchera Dancers for Parade Control of San Miguel de Allende. Each has dressed for the contest. Each has been picked for their skill in dancing. Each knows that the winner determines who will be in the Afternoon Parade. The judges are scattered around the Jardin waiting. His drummer is ready. Her Kenny G music is ready on the boombox. Each will dance for five minutes, and then be judged. The winner will determine Conchera Dancers or Gang Members for the Afternoon Parade. The contest will happen again to determine Evening Parade and again the next day for Morning Parade. The battle for control of San Miguel de Allende is often fought in these seemingly small but significant encounters during the Fiestas de San Miguel. Little by little Gangs gain more and more control of what happens until someday it is hoped there will be a Thanksgiving Day Parade.